Robots have been the stuff of sci-fi for nearly 100 years now. There’s something inherently fascinating about something that moves like a human, or thinks like a human, and isn’t one. 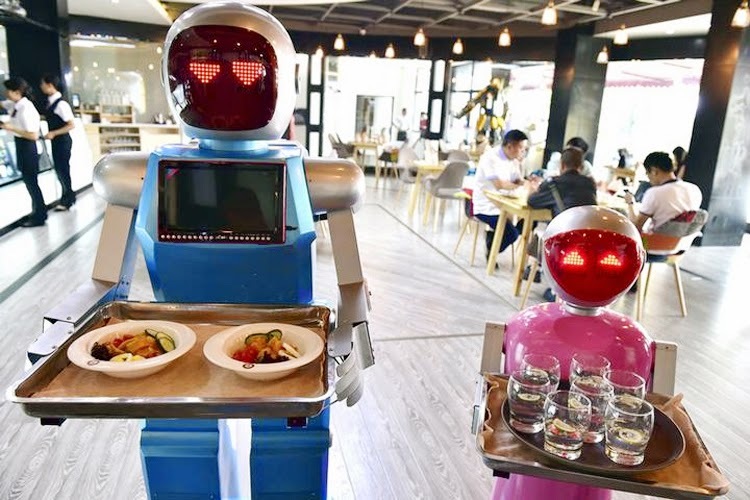 Robots will become a bigger part of our lives, and a much bigger part of the way we think about the world, and about the big changes we’re seeing in the economy. Robotics technology is advancing in a way that robots are going to take over most labor jobs. Robots can be: drivers, astronauts, soldiers, babysitters and rescuers. 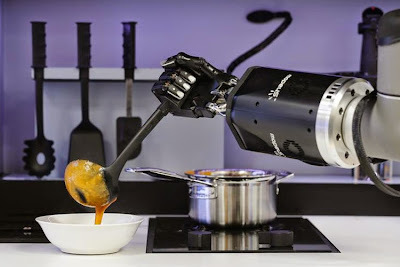 Time saving robots is here to lend you a hand. 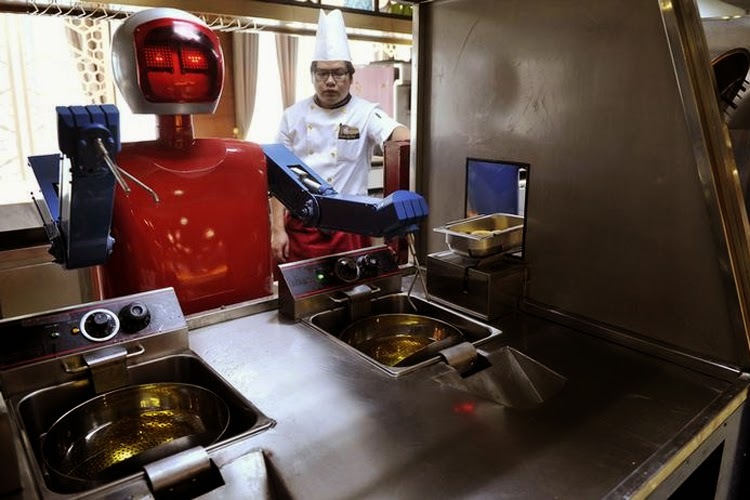 With advancements in technology, robots have started to replace humans like never before. Be it serving food in restaurants or working in fields, humanoid robots are today capable of doing everything that would have once remained only a figment of our imagination. Robots – ranging from giant welding machines in car plants to 3D printers – are currently used in only 10 per cent of the manufacturing jobs that they could perform. Within a decade that figure will rise to 25 per cent, according to the Boston Consulting Group (BCG). Take a look at the photos below featuring robots working as waiters, scientists, cooks, rickshaw pullers and other roles you would normally associate with humans. Robot couple Xiaolan (L) and Xiaotao carry trays of food at a restaurant in Jinhua, Zhejiang province, China. 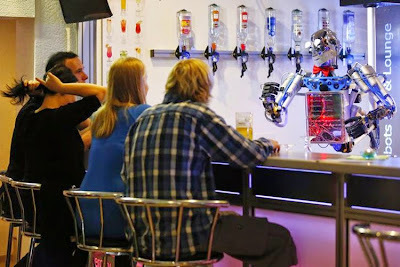 Humanoid robot bartender "Carl" gestures to guests at the Robots Bar and Lounge in the eastern German town of Ilmenau. 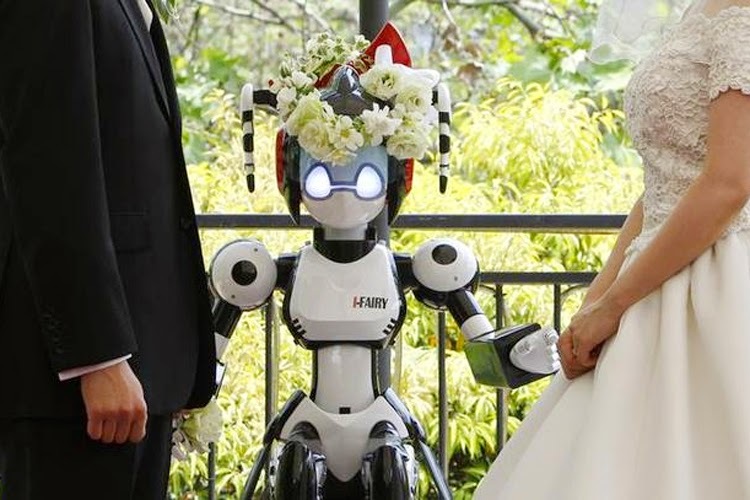 A humanoid robot named "I-Fairy" (C) acts as a witness at the wedding ceremony between Tomohiro Shibata (L) and Satoko Inoue in Tokyo. 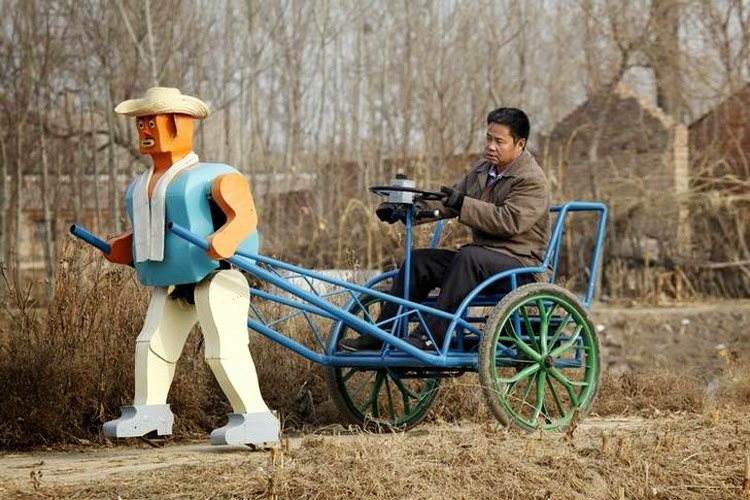 Farmer Wu Yulu drives his rickshaw pulled by a his home-made walking robot near his home in a village at the outskirts of Beijing. 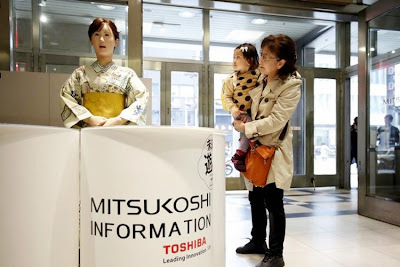 Visitors look at a kimono-clad android robot (L) named Aiko Chihira, developed by Toshiba Corp., at the reception desk of Nihonbashi Mitsukoshi department store in Tokyo. 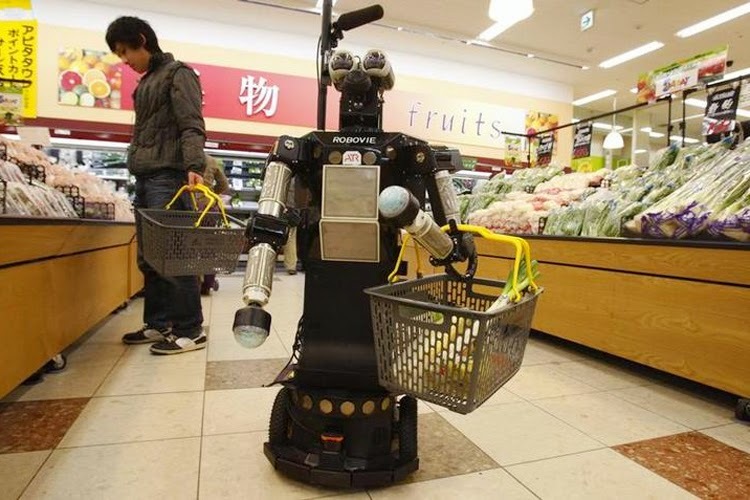 A robot named "Robovie-II" moves around a grocery store in Kyoto. 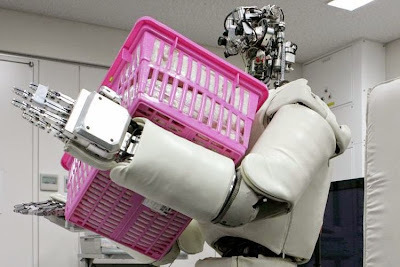 A humanoid robot, jointly developed by University of Tokyo and Japan's public research organization Advanced Industrial Science and Technology, lifts up a basket filled with coral sand weighing around 30 kg (66 pounds) during a demonstration in Tokyo. A robot in the Robotic Kitchen prototype created by Moley Robotics cooks a crab soup at the company's booth at the world's largest industrial technology fair, the Hannover Messe, in Hanover. 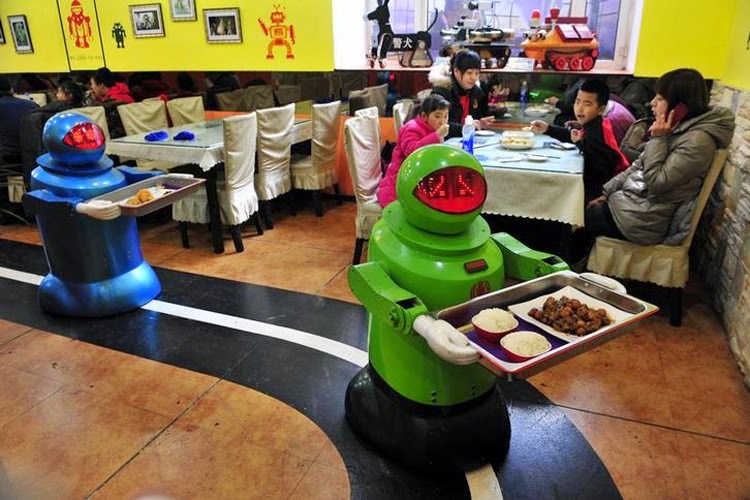 Robots deliver dishes to customers at a Robot Restaurant in Harbin, Heilongjiang province. 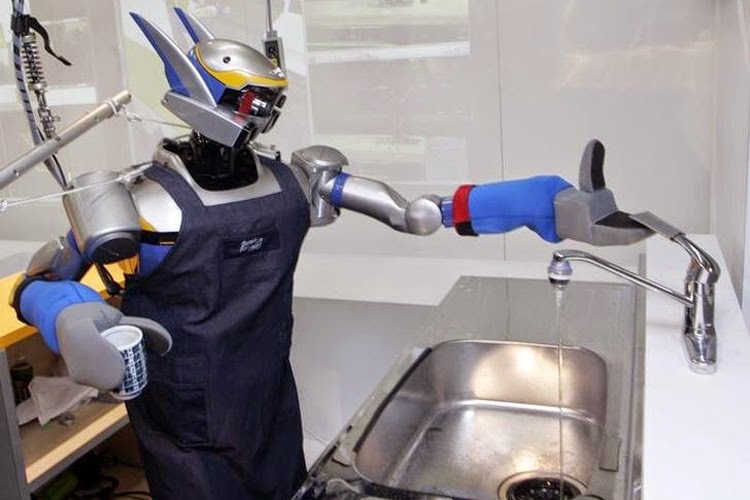 Humanoid robot HRP-2 uses a tap after washing a cup during a demonstration at Tokyo University. 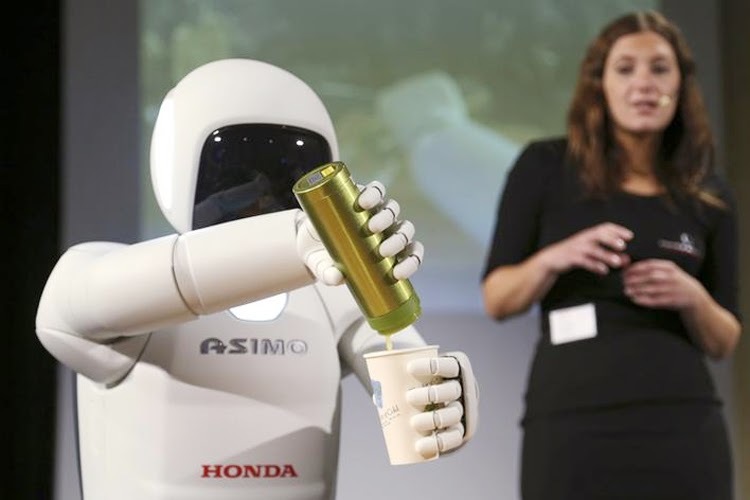 Honda's latest version of the Asimo humanoid robot pours a drink into a cup during a presentation in Zaventem near Brussels. 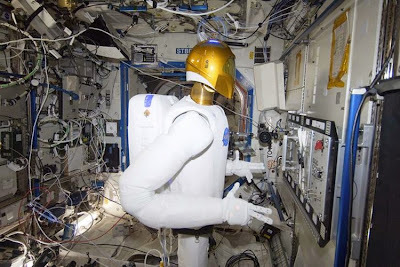 Robonaut 2 is shown in the International Space Station's Destiny laboratory during a round of testing for the first humanoid robot in space, as seen in this January 2, 2013 handout picture provided by NASA. There’s the science and engineering challenge of making an ‘autonomous robot, a robot that can do things for itself, run for that length of time in an environment it has no control over. Normally when you put robots into places you have to control everything, to tie things down, make sure nobody gets in the robot’s way. 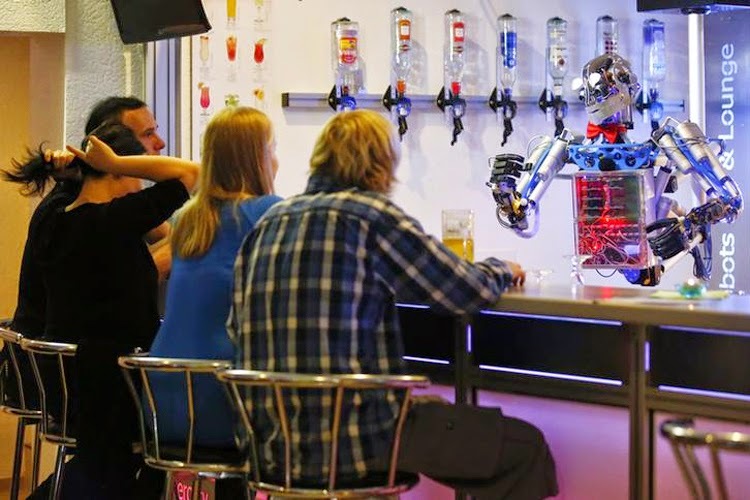 You want to be able to make a robot cope in a real human environment. Let’s see! This issue could be resolved in future due to the technology advancement.